Partnering Throughout The Supply Chain to Provide Accurate Conclusions in the Lab and Validation at the Well-Site. Laboratory Testing: Applying API Practices To Ensure Proppant, Chemicals And Cement Meet Or Exceed ISO Standards. PropTester, Inc. is an independent laboratory specializing in the research and testing of products utilized in hydraulic fracturing & cement operations. Our primary focus is to apply API (American Petroleum Institute) practices, ISO (International Organization for Standardization) standards, and PropTester procedures as a basis for qualifying fluid, proppant performance and cement integrity. By coupling our industry-wide knowledge with a defined quality assurance program, we partner with companies throughout the oil and gas industry to increase well productivity and profitability. 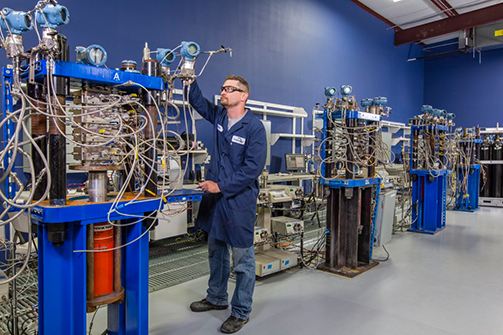 At our base laboratory in Cypress, TX, we have a full array of equipment for proppant testing, long-term conductivity, fluids testing, and cement quality analysis and control. PropTester also has the availability to test materials at the well site through the use of our Mobile Laboratories and expert field oversight. For accurate conclusions in the lab and validation at the well-site, contact PropTester today. PropTester is capable of analyzing frac sand, resin-coated, ceramic and specialized proppants through API/ISO standards and non-standard procedures at our laboratory in Cypress, Texas. Samples can be directly submitted to PropTester's facility or an experienced technician can collect proppant at plants, trans-load facilities, ports and well-sites to authenticate materials. Testing can also be performed in the field through the use of our Mobile Laboratories which are fully equipped for base-lab standard testing. As field expertise is vital to the industry, our experienced professionals offer on-site field oversight for both onshore and offshore wells. Prior to proppant offloading, PropTester will inspect field storage bins for potential contamination and cleanliness issues and assure quality throughout the job. As the proppant supply chain continues to diversify, PropTester can offer peace-of-mind by analyzing proppants at any time and validating the quality at the well-site. For more information on Proppant Testing or to request a quote, click here. Other tests include Hot/Wet Crush Testing, PT Crush Profile Test and Mineralogy. Additional information and procedures can be provided upon request. Researches continuously study reservoir specifics. By creating highly conductive proppant packs to maximize effective permeability while reducing fines and migration, overall well productivity can be increased. Past research has shown as little as 5% fines may reduce flow capacity by at least 50% via a change in median particle diameter (MPD). However, this is just one of several damaging mechanisms (e.g. polymer residue, fines migration, embedment, cyclic loading, etc.) that can harm proppant pack flow capacity. To better understand and address issues that can impact well production, PropTester’s laboratory evaluates hydraulic-fracturing and/or gravel-packing proppants with the industry Standard Conductivity Procedures (ISO 13503-5 / API RP-19D) as well as Well-Specific Testing Parameters. Specify your conductivity testing factors, up to 20,000-psi stress and 500°F. PropTester will then work with you to reveal and finalize the products that best meet the needs of your specific fracturing application. Any quarried sandstone, limestone or downhole core can also be shaped by an automated surface grinder to simulate formation material in these conductivity tests. PropTester is also equipped to test regained / retained propped fracture conductivity to measure the impact of fracturing fluid on the proppant pack performance. For more information on Conductivity Testing capabilities or to request a quote, click here. PropTester exclusively offers Single Point Conductivity testing with our patented PS-50® - Point Specific 50 Hour Long-Term Conductivity Test. This test provides answers to proppant flow capacity at your specific reservoir pressure and temperature environment. Customers select the proppant, temperature and pressure profile to answer specific engineering questions. Click here for more information on PropTester’s PS-50 Test. Due to the high demand for conductivity research and testing, PropTester has recently expanded its lab capacity by 50% making it the largest conductivity lab in the United States. This increase in equipment better allows PropTester to provide customers with accurate reports in a timely manner. Many properties need to be considered when selecting the right fluids for your well. PropTester provides extensive research and testing capabilities both inside the lab and at the well-site to determine which fracturing fluids are best suited for your specific field application using standard and well-specific procedures. Our expert lab technicians can work side-by-side with clients to validate current fluid systems and also work with companies to create new systems. All data is maintained centrally by PropTester for future comparison or application, as needed. PropTester®, Inc. provides in-depth test results on raw and refined guars from across the globe. The demand for guar in the oil industry has risen over the past few years and several new areas have been experimenting with growing guar beans. With this in mind, the quality of the product is very important. In-depth guar testing includes particle distribution, moisture content, hydration time, cross-link performance, insoluble acid residue, and the measurement of pH. Fracturing fluid can reduce proppant pack conductivity by 90% as it is being placed in the formation. Regain Conductivity is performed measure the impact of the fluids on the proppant pack. This test can be customized to well specifics up to 20,000 psi and 500F. Set up includes a baseline and can test up to three other samples at once. Flow Back and Beta Factor testing can be added upon request. Pre-job fluid rheology profiles and breaker schedules can be obtained with recommended formulations using a high pressure / high temperature Rehometer. Customize your tests to suit your needs. Shear rates from 1 to 1000 sec-1, up to 500F and 2000 psi. All data is maintained centrally by PropTester®, Inc. for future comparison or application, as needed. Other tests include Fluid Compatibility testing, Friction Flow Loop testing and Barite Testing. To directly contact our fluids laboratory or request a quote, click here. PropTester fluid specialists are on location (onshore or offshore) prior to the stimulation treatment to ensure quality. Tasks include identifying chemical additives, auditing chemical & base fluid inventories, evaluating chemical compatibilities, verifying cross-link times, and calibrating chemical feed pumps. The job design, a pre-frac material balance, and treatment schedule are reviewed with service company personnel and the operator representative. Chemical inventories are documented during each stage and the final mass balance is calculated. Proppant transportation & delivery records are also recorded as part of the fluid service. The life of your well depends on successful cementing operations. With intricate well designs and completion practices, cement failures have become an increasing threat. 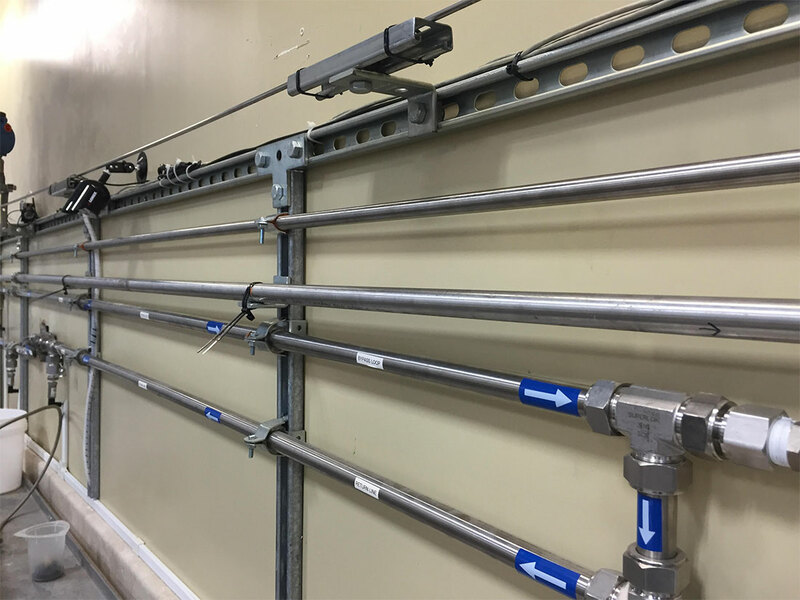 PropTester aids in all aspects of cementing; from planning and designing to proper oversight procedures throughout the job on all types of casing strings. Technical cement testing is utilized through our new Cement Laboratory. Avoid the costly repairs of remedial cementing, reduce liability and allow for production and stimulation operations to be safely conducted by utilizing PropTester’s cement testing equipment and expert personnel. To directly contact our Cement Laboratory or request a quote, click here. The Friction Flow Loop System is designed to evaluate the friction reduction of fracturing fluids and its effect on proppant. Fluids and proppant can be mixed in a 160 gallon capacity blender then pumped through the triplex pump and manifold before reaching the flow loop. A Differential Pressure Transducer monitors the pressure drop across a 18 foot section of seamless stainless steel pipe. Pipe diameter can be customized. The setup is capable of 55 gallons per minute and the equipment can be designed as an open or closed loop system. The data is monitored through proprietary software to constantly record the pressure drop, flow rate, and velocity throughout the test. Percent friction reduction can be calculated from the pressure drop and velocity of the fluid and proppant within the system. PropTester offers consulting in API/ISO lab training for your lab personnel as well as assistance in the development of your own internal Quality Control Lab. This ranges from a list of equipment needed for procurement and on-site set-up of your lab. PropTester can also help supply you with various individual pieces of equipment and supplies that will ensure the completion of your project with the appropriate ISO/API equipment needed. The following pieces of equipment are available for purchase. To place orders or for questions regarding equipment sales, click here. Companies in need of lab space for research and development are welcome to rent space from PropTester’s facility. Upon availability, we are capable of housing all forms of oil field testing, including proppant ISO/API with an option for long term conductivity machine rentals, full fluids set up - including a custom Flow-Loop System and API Cementing Testing. Full-time lab technicians and a personal security system can be utilized. For more for information regarding lab space rentals, click here. PropTester®, Inc. can determine the quality of your water and its scaling tendencies. A water analysis can be partial or complete depending on requirements. When a complete water analysis is needed, then one is able to complete a Stiff plot which reflects a fingerprint of that particular water sample. The fingerprint is composed of complementary anions & cations, representing water composition. As with many other products, the demand for Barite in the oil industry has risen over the past few years and several new areas have been opened for mining the ore. With this in mind, the quality of the product is very important. PropTester provides in-depth test results on Barites mined across the globe. Particle Distribution Below 6 um. For additional information or questions, click here.